We had to disassemble some of the frame parts to install the brand sign and relocate the cables through. However we also had to place it all back together which did not go as expected. Apparently the aluminium frame was slightly twisted, causing to much friction when placing back the frame pieces so they did not slide. This was solved by disassembling the two uprights at the sides and using brute strength when fastening the frame. Another final preparation was fastening the cable work. We originally did so with packaging straps, but for the fair we wanted something neat. Eventually ty-raps were used: clean and nearly invisible. The total structure was to high to fit through the door way, especially with the trolley’s and the brand sign. The final result of weeks of our work is presented at the science fair. We prepared a before and after poster telling the situation before our project started and about our project up until now. These hang from under the brand sign, strengthening the overall cohesive appearance. Also it was more clearly for people to understand what they read about, since everything was visible around the posters. We gave away folders describing our project with more detail, these were also on display so you could just get one if you wanted to know more. 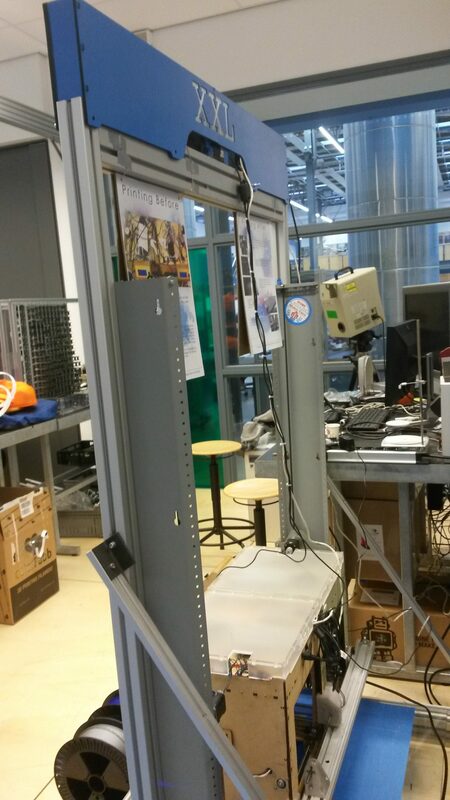 Besides we made sure that at all times at least two of us ware near the XXL Ultimaker to give extra explanation. We made sure we did everything to enlighten the visitors of the science fair as well as we could about our project. 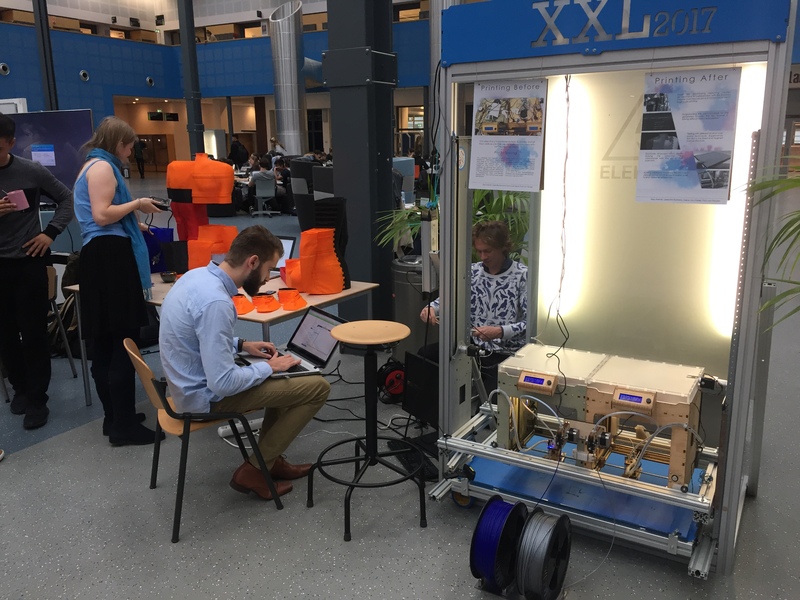 The result of the Exterior Design project was clearly visible by the XXL Ultimaker itself. To strengthen our design choices the 3D models were displayed as a film, showing the model form all sides, on the screen along with the timelapses from the previous weeks. The result of the Inner Change: Programming project is shown through the live print of the backpack we started. Furthermore we brought some of the prints we made to show the improvement of the postprocessing program. If someone had more questions we would happily explain. 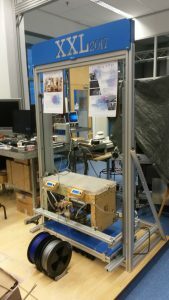 The final result of the Real World Application project was the live print. This was the latest model of the backpack, which was also on display on the screen. Since the backpack print only just started, there was little to see since it is a print of at least 2 days. To still have some real visual representation of the backpack we brought some of the prints of earlier models. The idea was to have the starter robotics’ project also at the fair, but we thought this would be to much. In the short amount of time we had with this project we tried to address as many problems as we could in the various projects, but of course there is still space for continuation and optimization. All of the future projects we have come up with are summarized below. First project Exterior Design, we definitely fulfilled our goal to improve and create a more simple and user friendly appearance. However this could be exploited further, for example the overall look over the Ultimaker casing could be painted in the same color as the Brand Sign or nicely finished with a blank coating. The Inner Change project was more than we anticipated in terms of workload. We have pushed through a lot of improvements, but as with problem solving and designing when you solve one you see the next. This process spirals onwards since there is always room for optimization, it is where you decide you put the finish line that you are done. For us the currently working post processing program is our finish line. Our goals where a bit ambitious since we wanted a person to be able to upload a file and than the program would do the rest. However our finish line is only the start of a new goal and new projects. It is with great joy that we know that a student assistant will continue working on our program and hopefully finish. The third project Real World Application can be optimized in so many ways. First of all the design basics are there but the actual fit with the calibration software and equipment can be tested. From this test more optimization points will follow and so the spiral starts. Furthermore, the future might bring new projects which we can collaborate with to improve the world. Project backpack 2.0, optimizing the design, maybe design process to fastly create a design custom made for each person. No project goes without some trouble, and we had some, not only project oriented but also as a team. These are the core of any team, if you don’t respect them you are bound to fall apart. From the beginning we did not really know wat we set out to do, this realization only came at beginning of the third week. We decided upon the two main stream project: Inner Change and Exterior Design. We did no foresee that what we had set as our goal would be so much more than expected. For example the post processing program project costed nearly fulltime work of 2 people. Also we did not foresee that there was only one person in our team that could really program, we could all help but only up to a certain point. This happened again in week 3 when suddenly a new project was introduced by our mentor: Real World Application. Looking back, the new project was actually to much to handle besides the other ongoing projects and just too little too late. This project made us realize that setting goals is of great importance, without them you are lost. But it takes even more to be able to adjust your goal and finish. This way you can learn even more from the process. Furthermore because we divided the project in two (and later on gained a third) we sometimes lost sight of each others work, causing misunderstanding of each others dedication. In the end of week 3 and twice in the final week, we sat together to speak our minds, clear the air and make a plan for the next days. The devision also influenced the Blog. We all needed to write about our projects and check each others work. In the end we all worked hard on the projects and left the blog for what it was. This caused a final sprint to get the blog neat and up to date. Overall the blog is not the most efficient manner of sharing our project since it is very hard to get a logical flow in our story. Looking back we moved a lot of work, exploiting all of our different qualities and became a better team. As a team we are proud of what we have accomplished and can only hope that someone will continue our work. The Ultimaker XXL was already working when we joined the project, though it could (and can) still be improved on many fronts. 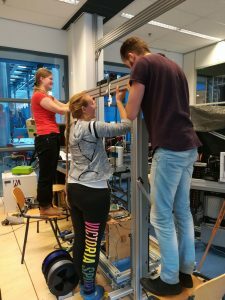 Because of this, we were faced with a wide choice of tasks, and a very short period in which to get to know the UM XXL well enough to decide where we could be useful. Since I have quite some experience with 3D modeling, I focussed mainly on creating models for the lid, covers, pi case and backpack. I learned during this project that to make the products, I needed to tweak and change the model I was working on several times. I went through a lot of iterations, discovering new problems as I went along. Though I tried, it is impossible to foresee everything, but eventually, everything fell into place (literally, all the cases and additions fit). I also enjoyed my first attempt at programming, when I programmed the interface for the cura plugin with python, with some tips from Dana. 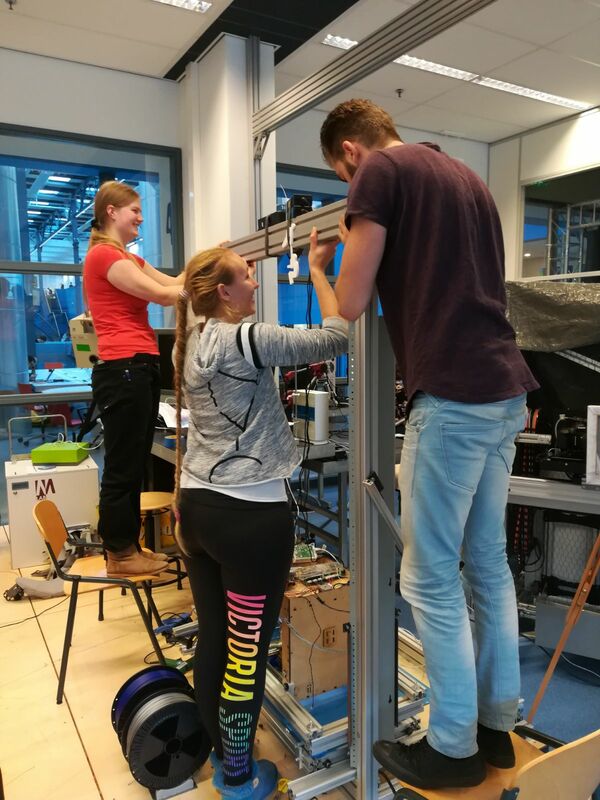 Finally, standing on the science fair was fun as well. In the end, I really enjoyed the modeling work, and seeing my models made flesh, so to speak. At first I was very uncertain, since we did not really knew what our goal was. I was over whelmed by the many aspects handed to us by or mentor. But this also gave me the ability to choose a project i could really confide in. The first few weeks where with a lot of ups and downs, we were all just finding our way and still getting to know each other and the project. One of the aspects that made everything unclear is that the add for this project was completely different from what we ended up doing. The add described that we would mainly work on the backpack project, only this was introduced at the very end of the project. It was very much this aspect, combining design with practical application that attracted me. I found this aspect in project Exterior Design and committed myself to this. In the end I really learned a lot, for example i learned to pilot the laser cutter and more ability’s with Rhino a 3D modelling program. I liked working with Elea on the project Exterior Design, we both learned from each other. I could find myself more in the hands on work, particularly the brand sign. This part really incorporated the Industrial Design side of the project as did the back pack. Where I could I would help with the programming, but I experience that my strengths are elsewhere. However I would like to learn more about programming with more time, since it is a handy skill to have. Above all I am proud to look back at this experience with joy and the amazing memories we made. As soon as we started this project I got very excited. My interest for 3d printing is one of the reason why I preferred this project above any other augmented prototyping projects. But in the first week I, and I think I can speak for the rest of the team as well, got confronted by the lack of knowledge for 3d printing. This meant we had to gain large amounts of information to better understand the project, making it a valuable first week. After a short amount of time I realised that for this project I, as a mechanical engineering student, had to work outside of my comfort zone since the mechanical parts (and most of the electronics) were already completed. Rather than struggling with this realization, I accepted the challenge. Working together with my multidisciplinary colleagues I learned a lot. Not only about 3d printing itself, but about working in a team and programming as well. Still, there is a lot of room for improvements when you take a closer look at the printer. Despite the fact that I am proud of our accomplishments, it would be great to see this printer being further developed. That is why I like to see our work as a start for other people to pursue working on. Our vision for this project was just to big for the time being. An important feature that I would like to see for future development is the elaborated version of the cutting process. I.e. dynamic cut lines depending on the dimensions of the object’s cross-section. I study computer science, and even though I like this study, I was really exited to completely move away from that for my minor. I was tired of all the math and programming and I was excited to do something completely different. So it is quite ironical that the main thing I did for this project was programming… I really liked it thought! In computer science we usually have to program something mathematically or something that supports the course theorie. This was completely different. It was a very practical program. I learned a lot more about programming and I also learned a new programming language; python. I think we also worked well as a group, everyone could use their own strengths. However, next time I would do some things different in my communication with the group. I’m really used to computer science fellow students, that know how to help programming, debugging and designing a program. I did not communicate well with my group how much time I was actually spending on the program, this caused me quite a lot of stress and I got a bit frustrated because I felt like they did not help me enough. However, in retrospect I think I just assumed they know how to debug and design like computer scientists. They were working hard in different areas of the project and I did not really realize this. We had a good talk about all this and we were able to speak our minds and solve the problem, which was nice. Overall I learned a lot from this project, and I’m pleasantly surprised that I learned a lot more about programming which will be helpful in my bachelor.